Frank Beltran speaks annually or co-chairs legal seminars and conferences on topics addressing ethics, legal malpractice and professionalism. 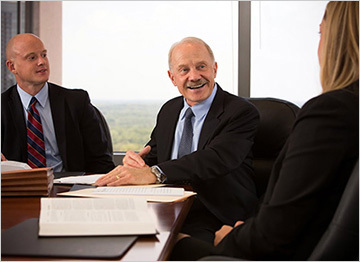 The American Bar Association, State Bar of Georgia, Georgia Trial Lawyers Association and Atlanta Bar Association are among the organizations that invite Frank to make presentations. Below is a list of some of his recent presentations. Comments: Frank has spoken annually at this seminar for over 20 years. Jeffrey M. Smith originated and co-authored the now five-volume treatise Legal Malpractice with Ronald E. Mallen. Jeff introduced Frank Beltran at the 2014 seminar noting that: “Frank Beltran … has written a compendium that … is not only a superb seminar material, it’s a book." Comments: Frank has chaired or co-chaired this seminar annually for over 25 years. Speakers and panel members include former Governor Hon. Roy E. Barnes, Georgia Supreme Court Justices, Court of Appeals Judges, Trial Court Judges, Law Professors and Experienced Trial Lawyers who represent both plaintiffs and defendants. Comments: In this Atlanta Bar Association seminar held at Alston & Bird, Frank covers ethics and steps lawyers can take to prevent legal malpractice lawsuits and bar complaints. Panel: Moderator Shari L. Klevens, Partner and Deputy General Counsel, Dentons US LLP, Washington, DC; Frank J. Beltran, The Beltran Firm, Atlanta, GA; Laura B. Frankel, Consulting Director, CNA, Chicago, IL; Rachel T. Nguyen, Loss Prevention Counsel, ALAS, Inc., Chicago, IL. Comments: : “Punitive damages are not typically covered by professional liability insurance but the possibility looms large for attorneys facing actions involving allegations of fraud, dishonesty, malice, or intentional conduct.” To read more about the ABA conference, please click here. Comments: This seminar was held at the Georgia State Bar Association's Annual Winter Meeting. In addition to Frank, the other specialists/speakers on legal malpractice claims and prevention were J. Randolph Evans and Shari L. Klevens, Dentons US LLP, Atlanta, GA & Washington, DC, and co-authors of Georgia Legal Malpractice Law; John C. Rogers, Carlock, Copeland & Stair LLP, Atlanta, GA; Christine L. Mast, Hawkins Parnell Thackston & Young LLP, Atlanta, GA; and Susan W. Cox, Edenfield Cox Bruce & Classens PC, Statesboro, GA.